2018 WBC Game Auction Last updated 10/13/2017. The 14th Annual WBC Game Auction will be held in the Grand Ballroom from 10 a.m. to approximately 5 p.m. on Tuesday, July 24. 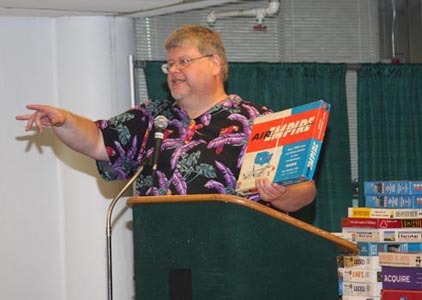 Auction staff will attempt to group offerings by theme, with Euros/Family games proceeding Strategy/Wargames and the “most collectibles” saved for last. You must be registered for the convention and have an official Bid Number to bid. The Bid Numbers are available from the auction staff at a cost of $1, non-refundable. The staff will begin selling the Bid number’s at 9:30 am on Tuesday, July 24, through the end of the auction. See the staff at the payment table to obtain your Bid Number. The Auction Staff does its best to accurately describe items up for bid, but they are not responsible for mistakes or missing components. The staff will try to validate the condition of all items sold, but by accepting a Bid number, prospective buyers agree to hold WBC and its auction staff harmless in the event of disputed merchandise. All sales are final! All bids will be in $1 increments. If you cannot afford to bid a full dollar, you should not be bidding. Auctions proceed quickly so bid loud and clear. If the auctioneer cannot see or hear you, it’s your fault. Feel free to shout out an amount, the auction staff appreciates it. The auction staff will be bidding on items as well. Please feel free to bid against them – they will be bidding against each other anyway, so why shouldn’t you?! In God we trust, all others pay cash. When you win an item, you must immediately come forward to the cashier and claim your purchase. We are not set up for checks, credit cards, or paypal. Buyers who fail to complete their purchases promptly in the view of the cashier will forfeit their bid number immediately. Tabs are only available by special arrangement with the auctioneers and require a non-refundable cash deposit. This deposit will be credited towards your purchases but unused balances are lost. Please see the head auctioneer PRIOR to the start of the auction. All tabs must be settled, IN CASH, immediately after the auction. Who can Sell and what can be Sold? Selling is limited to those with a current WBC badge. Due to the specialized nature of WBC as a game convention, only games and accessories pertaining to them can be sold. Auction lots will be limited to approximately the first 550 lots submitted and approved by the auction staff. Once again this year, Sellers are required to register their lots to be sold to the auction staff for their review and approval. All auction lots must be registered after auction registration officially opens and no later than June 15 or whenever the maximum is reached, whichever occurs first. To submit items for the auction, sellers must complete the Auction Registration Form, which will be available when registration opens, and email the form to the auction staff. Please be sure to include the words “WBC Auction” in the subject line. The form requires you to provide the name of the Game, the game publisher, the minimum bid (which must be $1), and the condition. See the item description section above for the choices on condition. Please do not add lines to the form. Additional tabs are provided for more than 25 items. Do not send the Auction Item Sheets when submitting your items for inclusion in the Auction. Reminder for 2018: Submissions of less than 10 items will not be accepted for the auction. A non-refundable fee of $1 per lot submitted will berequired upon submission. Low value items should be sold as a group in one Lot—both to minimize your fee and to save time—or committed to the Auction Store. All submissions will be subject to a $1 Minimum Bid. Lots may not request a Minimum Bid of more than $1. You should receive an email confirming your submission within 48 hours. In the second half of June, you will receive notice as to whether your items were accepted or rejected for the auction. ***IMPORTANT*** If your items are accepted, complete the Auction Item Sheet (available when registration opens), attach it to your games with painters tape, and bring the games during the check-in time for the auction to the Grand Ballroom. The check-in time for auction items is 2 p.m. to 10 p.m. on Monday, July 23. Sellers are responsible for collecting unsold items promptly. Sellers need to claim their unsold items within a half hour of the conclusion of the auction in the Grand Ballroom. After that, the items will be at Registration. Items unclaimed by 12 p.m. on Sunday, July 29 become the property of the BPA. Sellers will receive 85% of the selling price, rounding the amount to the nearest dime, upon providing a current WBC badge matching the Seller’s name and picking up their unsold games. Payouts will be available at Registration by 12 p.m. on Thursday, July 26 and will remain available during registration hours throughout the convention. Amounts unclaimed by 12 p.m. Sunday, July 29 are forfeit to the BPA. Payouts exceeding $100 will be by check. The BPA will exercise reasonable care in safeguarding your items, but we assume no responsibility for lost, stolen or damaged goods. Unsold Lots should be claimed from the Auction registration crew in the Grand Ballroom by showing your WBC badge with a matching Seller name no later than a half hour after the end of the auction. Lots left beyond that time will be secured to the best of our ability and claimed only at the convenience of the convention staff in Stag Pass. Items unclaimed by 12 p.m. on Sunday, July 29, become the property of the BPA.